*Disclaimer: While our fun is Certified Unserious, we take your safety and the safety of your groms seriously. From day-to-day operations to long-term planning, we always have your safety and our environment's best interests at heart. That could be why we've won numerous awards for outstanding dedication to safety and the environment...just sayin’. Sierra has several “Slow Zones” that visibly designate an entire run or area as a “Go Slow Area”. These Zones are marked with yellow fencing and are patrolled by Ski Patrol and Mountain Safety to ensure a maximum 15 mph speed limit. We are an avid supporter of “Smart Style” - a Freestyle Terrain Safety initiative developed by the National Ski Areas Association and Burton Snowboards. Not only is our snow organic, our views are organic too. Take our Grandview chair to the top of the mountain and take in beautiful Lake Tahoe from a peak of 8,852 feet. After you’ve had your fill of the views, shred down 2,000 acres of your own personal playground, made with 100% organic GMO-free snow. Sierra is just a stone's throw away from Sacramento (If you could throw a stone 91 miles - we believe in you, bro). Traveling from even further? We’ve got you covered. 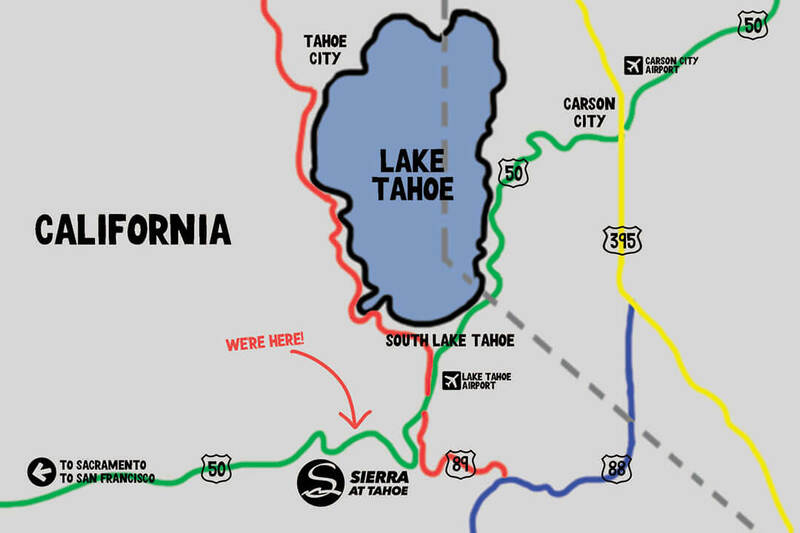 Sierra is only 51 miles from the Reno/Tahoe International Airport and 187 miles from San Francisco International Airport. 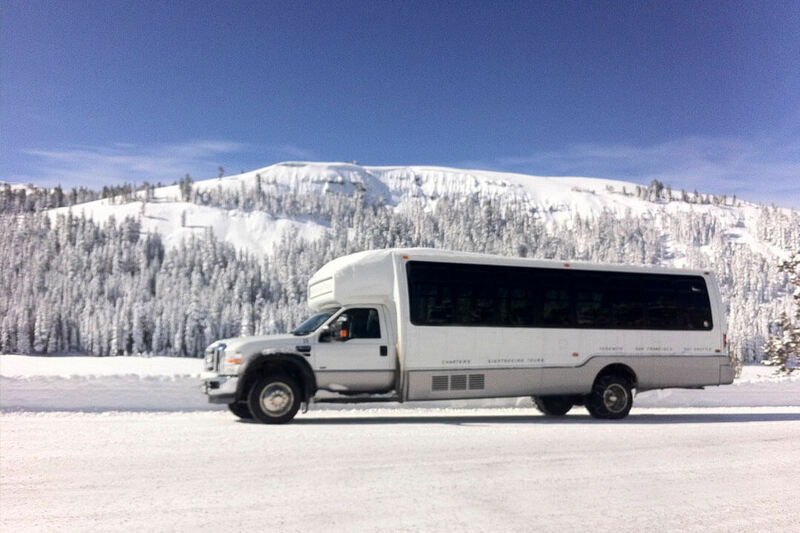 FREE Shuttle bus service is offered from three main transportation hubs in South Lake Tahoe and the South Tahoe Express Shuttle provides round-trip transportation from Reno-Tahoe International Airport to South Lake Tahoe. 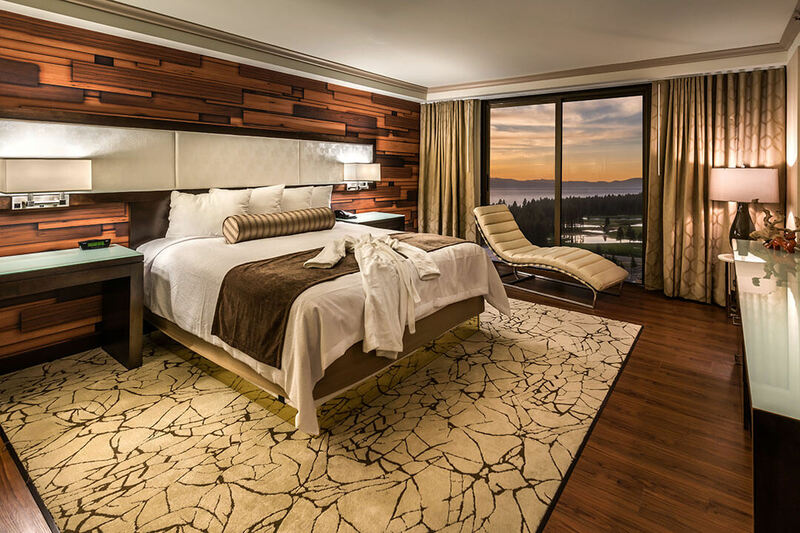 While there is no shortage of hotels to stay at in Tahoe, we have a few spots that give the Sierra family the homie hookup. 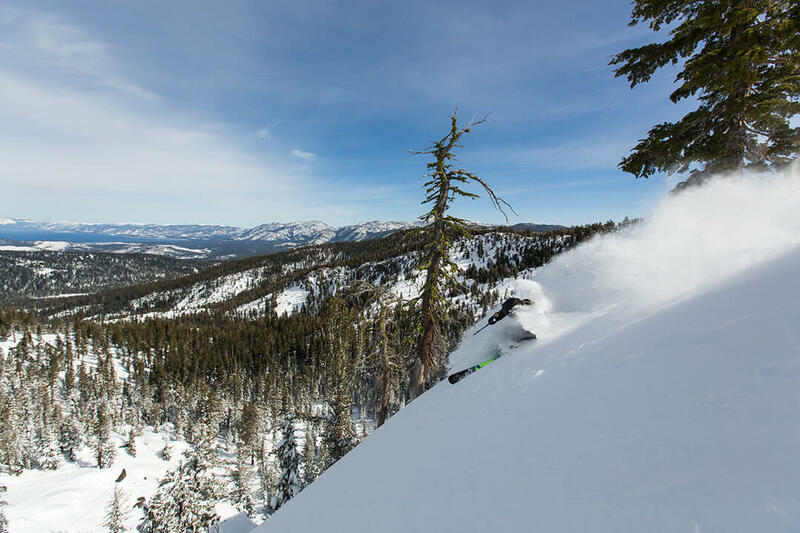 We recommend Lake Tahoe Resort Hotel, located centrally in town at Stateline, or Aston Lakeland Village which offers a free daily shuttle, a full kitchen in each unit, and an in-house rental shop so you can skip the hassle and get straight to shredding. If you're coming from the Tahoe area, Sacramento, or San Francisco, there are shuttle bus options to Sierra. At just $369, the Sierra Unlimited Pass saves those hard earned dolla bills while ensuring you never miss another champagne powder day! Valid any day all season long, which means you’ll get a goggle tan so deep your homies will never question your dedication to shredding again! If you’re ballin’ on a ski bum budget and enjoy shredding during the week over the weekend, the Sierra Value Pass is the best deal in the Tahoe basin! Ski or Ride Sunday-Friday for just $319, excluding Saturday’s + blackout dates! An Adaptive Season Pass is available to guests with a permanent medical condition who can supply qualifying, written documentation. For more information about our Adaptive Pass or to purchase, please email the Season Pass Office or call 530.659.7453 x108. Get more out of your season pass, like up to 20% more for the $$$ you already spend around the resort, access to member's only priority lift lines with a free Fast Pass + a FREE midweek, non-holiday lift ticket for a pal! Access the priority "Fast Pass" lane at Grandview, Easy Rider, and West Bowl chairlifts + you'll surely be losing your mind on how many laps you can smash! Valid for all ages, any day at Sierra-at-Tahoe. Valid lift ticket or season pass is required. Enjoy Preferred Parking any day throughout the season and park just steps from the slopes You'll spend more time on the mountain by avoiding having to carry gear from the outer reaches of the parking lots. Sierra’s 3-PAK lift tickets are perfect for those too busy working for the man to commit to making it up to the mountain regularly. Ski/ride for just $76 ANY day with NO blackout dates. Since you don’t have to use your days consecutively, you can save your 3-PAK for those powder days when you suddenly develop a cough and can’t make it to work (wink wink). For all you afraid of dropping more cash than Verizon does phone calls, Sierra’s First Time Group Lesson Special is a legit money-saving option to get you feeling confident on the hill. Package includes a limited access lift ticket, rental equipment + a 2-hour lesson. If you've got your eyes on new gear, or just want to check out the new technology everyone is jabbering about in the lift lines, try a top-of-the-line pair of skis or a snowboard from the Sierra Demo Rentals Shop! Save your hard earned cash money with the best demo deal around at only $68/day! The 3-PAK Demo Rental is valid any three days during the season. Non-transferable. Stats on Stats on Stats! Sierra-at-Tahoe is 2,000 acres of top-to-bottom fun, starting from our base at 6,640’ elevation, all the way up to 8,852’ at our peak. That includes 2,212’ of vertical rise, for all you adrenaline junkies! With 46 trails and 14 lifts we’re confident you’ll be able to experience it all. 6 different zones including adventure zones for kids. 6 different terrain parks hand sculpted and perfected by our very own park gnomies. Sierra-at-Tahoe’s Park is recognized among the Top 10 in the nation. 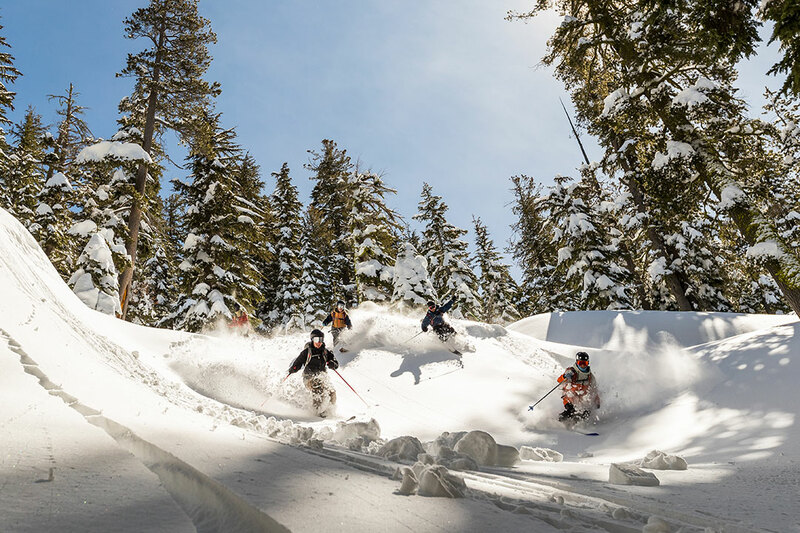 If you’re feelin’ a little sendy, are craving some untouched pow, or missed out on breakfast and just need some Huckleberry Jam in your life… check out our Huckleberry Canyon which is accessible from 5 different gates. Any local will tell you Sierra has the best tree riding in the Tahoe basin! That’s probably because we re-arrange the trees each night to keep the runs fresh and fun every day. Our snow is 100% locally sourced and GMO free, crafted for your riding pleasure. Mother Nature blesses us with an average of 400+ inches of organic fresh pow every winter, making Sierra your personal winter playground from late November to late April. No winter vacation to Lake Tahoe is complete until you have raced down the tubing hill at Sierra-at-Tahoe in a gigantic doughnut, building snowmen (or snowballs!) or eating smore’s while warming up with hot chocolate around a fire pit at Blizzard Mountain! Sierra-at-Tahoe isn’t just for skiers and snowboarders, it’s very anyone and everyone that likes to enjoy fresh Tahoe air and 100% organic GMO-free snow. That’s why we maintain 3 miles of snowshoe trails that wind through scenic hideaways and pristine alpine terrain. Take a self-guided romp through the woods and enjoy all the mountain has to offer. There's Endless Fun on + off the Slopes! There’s more fun to be had once you’re off the slopes here at Sierra - from live music, competitions, events + more. So, once you’ve had your snow fix, rest those legs + scope out our event calendar to see what’s crackin. Sierra's on-hill food options cover all the bases, from Southern-style BBQ, juicy burgers and soul-warming chili to ancient grain rice bowls, surf tacos and Spanish-style bocadillos ... we've got something for everyone to eat while spending a day on the slopes! With plenty of indoor + outdoor activities for your little ones who aren't ready to hit the slopes, our licensed childcare center will keep them playing all day. Conveniently located at the base of the mountain, you'll be able to check in on them between laps.